After having installed Glowstone for your operating system, you can start your server using the script you created. The first information is the software version, 2018.4.0-SNAPSHOT. The SNAPSHOT suffix is only present on development versions (i.e. not releases). The second part is a hash segment uniquely identifying the build you are using (be008ff). In parentheses is the Minecraft version supported by the server (MC: 1.12.2). Finally, the API version is the Glowkit version the server implements (1.12.2-R2.1-SNAPSHOT). When you first start the server, it will need to download some additional libraries from our repository in order to keep compatibility with some plugins. This may take a few seconds depending on your internet connection. More information about libraries can be found in the `Library Management`_ section. Your server will then scan for plugins inside the plugins directory. Once it finds compatible plugins, they will be loaded before the worlds are loaded. If you are familiar with Bukkit plugin development, this is the time when the JavaPlugin#onLoad() method is executed. The server will load world files from disk, located by default in the worlds directory. If it can’t find a world, it will create it and start generating the terrain. Again, this may take a while depending on your hardware. After the worlds are loaded and ready, the plugins that were previously loaded are now “enabled”. Once it is ready, the server will open itself on a TCP port. By default, this is port 25565, and can be changed in the server configuration. For more information, refer to the Configuration Guide section. [INFO] Successfully bound server to 0.0.0.0:25565. Once the “Ready for connections.” line is output, your server should be reachable by clients. Failed to bind to address. Maybe it is already in use? When starting the server, please make sure you do so by following the methods in the installation instructions, instead of double-clicking the JAR. If you do double-click the JAR, the server will start up, but you won’t have any console, so you’ll have to kill it using the task manager or whatever process management tools are relevant to your system. If you’re converting from Bukkit, make sure you’ve stopped the old Bukkit server, if you plan to use the same port. Make sure you’re not running more than one copy of Glowstone on the same port. Check that you have no extra Java processes running. 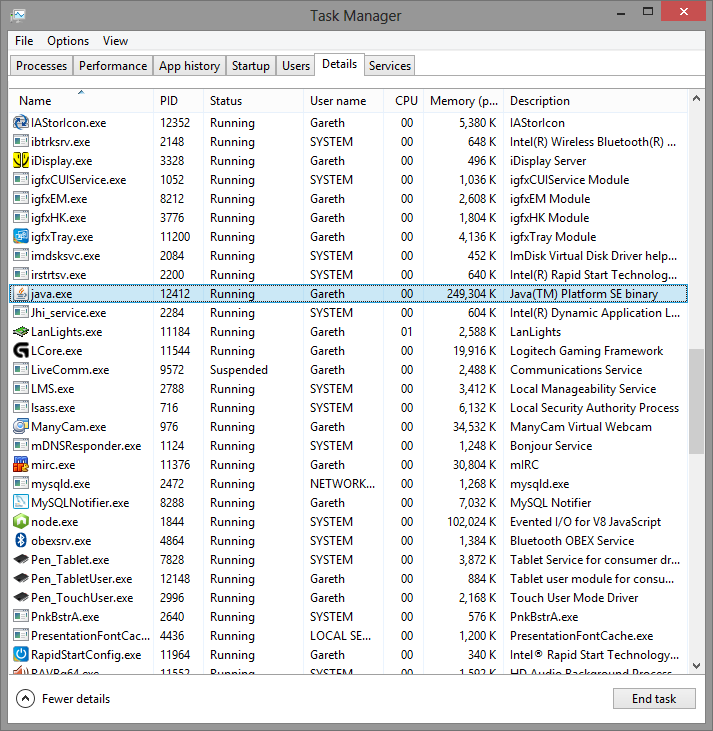 If you’re on Windows, use the Task Manager. You might not want to kill some of them, such as the Minecraft client. If this still isn’t working, please check whether you have an ip set in the server section of your config/glowstone.yml file. If you do, please consider that most people will not need this entry - it’s only useful for people running large servers with multiple network cards. In the majority of cases, you can simply remove this line from your file. If you’re convinced that you need it, it should contain only an IP address - usually of the form a.b.c.d, from 0.0.0.0 up to 255.255.255.255 for IPv4.